Nowadays, a large number of people are entered into new business. But the growth of the company depends on many factors. It includes managing different departments efficiently, perfect management of marketing department, proper communication channel, accurate account management, good customer service, inventory and production management and much more. If your business is not showing promise in the last year, then it’s time for managing your company process much better by implementing an ERP system. ERP is a centralized system that takes care of different faces of business and helps to grow. With the help of ERP implementation, we can easily build streamlined business process and systematic and organized workflow. Let's get started with the important signals that tell you to change to ERP system. ERP Software automates and integrates core business processes such as taking customer orders, scheduling operations and keeping inventory records and financial data. But, when should your company consider ERP solution? There are many alarm signals that can tell you that you need to implement ERP as early as possible. Getting various inventory numbers in the calculation and reality. So this is now a good time to automate and the whole inventory process. The deviation or error may occur due to manual entry or manual calculation. Another important sign is the decrease of clients and eventually revenues. The loss of clients can be the result of bad customer service, lack of CRM features, lack of any marketing strategy and much more. All of these can be fixed with an efficient ERP solution. The main reason for the loss of profit is the lack of logical flow required for making a revenue. Proper Reporting of every process is important for the success of any business. Without reporting, it will become hard to gain and analyze the information. The analytics would not be much of use if it installed without any perfect reporting tool or automation. Without proper reporting we can not get performance report of all employees or monthly sales report or monthly talent acquisition report etc, If we didn’t get these reports we can not plan any new marketing / Customer relationship management or HR related strategy. All of this will cause a negative impact on business and may lead to a lack of customer insight, growth or any other analytics. Another noticeable signal that your business needs ERP software will come from your accounting department. Any large company would want to have a proper accounting of works. You need to consider how much time is being wasted on tasks that ERP software can handle in an instant. it is time to go for ERP implementation and work on the different aspects of the accounting. ERP not only managed the accounting procedure but also updates different modules in any business including human resources, payroll, general ledger, etc,.With all financials in a single database, accounting staff won't have to spend hours cross-posting information, rekeying numbers, or reconciling data manually. Your accounting staff will be more productive, freeing them to deliver critical reports without delays and frustration. These days, it’s key that your teams can access the software they need to manage and steer your business from wherever they are working. This is especially the case for marketing and client relationship management staff who need to be able to access and update prospect and account information when they on the move. Look for software that is accessible via a range of devices – including smartphones and tablets – from wherever internet access is available. Just like humans, ERP system also has a life. ERP last for 7-10 years at max. After that, it becomes hard to maintain or upgrade it with new functionality. 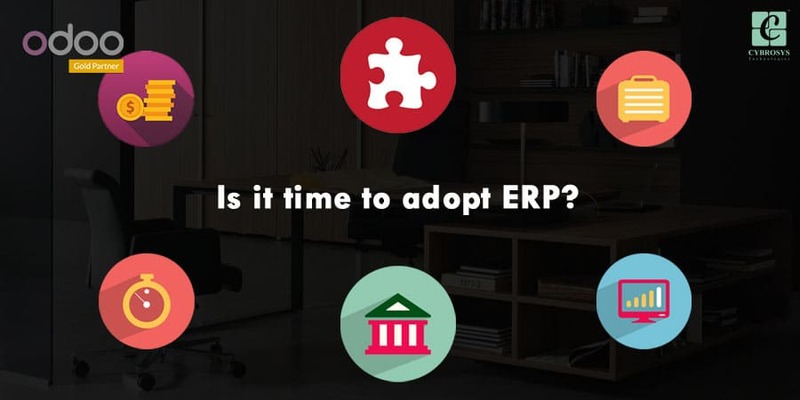 If you think that your ERP is not upgraded friendly or is failing to do current business process efficiently, it is the peak time to get a new ERP system. Our recommendation would be Odoo , an open source business suite ERP that aims to deliver the best in class ERP solution for any business. It is a known fact that Odoo customization has tons of benefits and can actually automate and streamline the business process. It is also easy to do Odoo development and customize the ERP according to the organizational requirements.